Treating founder, or laminitis, in a horse really takes a village. Laminitis is always a veterinary emergency. You'll also want to get your farrier involved, since laminitic horses require corrective trimming or shoeing. You might need to make changes in your horse's living arrangements, especially if he's turned out in a lush field. He'll likely require dietary adjustments as well. Technically, laminitis occurs when the hoof tissue binding the wall to the bones -- the laminae -- become inflamed. Founder occurs when the laminae break down and the horse's coffin bone starts rotating within the foot. In a worst case scenario, the coffin bone sinks through the bottom of the hoof. "Sinkers" usually require euthanasia, but less severely challenged horses can be treated. Laminitis is quite painful, and the prognosis depends on various factors. While horses with laminitis might recover, those in disciplines requiring jumping or other situations in which the front feet take a lot of concussion might have to find a new career. Laminitis results from numerous causes. If your horse got loose and feasted in the grain bin, call your vet immediately even if he shows no signs of illness. The carbohydrate overload can cause issues elsewhere in the body, with the metabolic disruption leading to laminitis. Horses recovering from surgery are prone to laminitis. The 2006 Kentucky Derby winner Barbaro was euthanized because of laminitis, not his broken leg. Grass founder results if a horse unaccustomed to grass is allowed too much access. Any toxic reaction within a horse can cause the condition. Laminitis most often affects the front feet, although every hoof can be involved. Your horse might stand with his hind feet beneath him, trying to alleviate the pain in his front hooves. Your horse's feet will feel warm to the touch, with a noticeable digital pulse. Before she gets to your barn, your vet probably will advise you to either run a cold hose on your horse's feet to cool them or put him in ice boots, if you have them. Your vet will give your horse pain medication, along with vasodilators so that blood can more easily access the hooves. Other drug treatments could include antibiotics for infection and anti-endotoxin serum to fight toxins. Your horse initially will be confined to a stall bedded in shavings or another soft material. He can't receive grain -- his food will be limited to grass or timothy hay. If your current farrier isn't experienced in the treatment of laminitic horses, ask your vet for a recommendation. As time passes, a good farrier is even more important than a vet in managing the horse with chronic laminitis. Your vet will X-ray the feet and share the radiographs with your blacksmith. At first, your farrier might put pads on your horse's feet or even Styrofoam, which relieves pressure on the hooves. If the coffin bone seems stable, your farrier will therapeutically trim the hooves and possibly apply shoes. 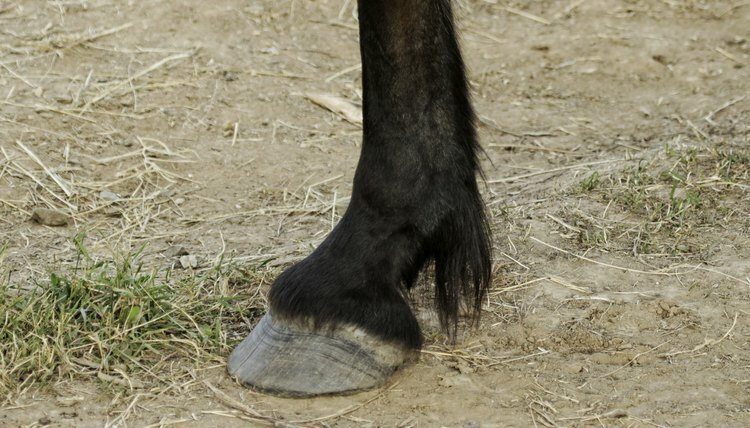 Your horse probably will experience abscesses from the necrotic tissue within the hoof. That means you'll become an expert in the best methods to draw out and treat an abscess -- including salves and soaking with Epsom salts -- or have your vet or farrier attempt to cut it out. Even if your horse recovers completely, he'll require special management for the rest of his life to avoid recurrence. That might mean frequent shoeing -- once a month rather than the typical six- to eight-week interval. Keep him at a healthy weight. Keep him off rich pastures, or put a grazing muzzle on him during turnout. Ask your vet about supplements that can aid laminitic equines. With careful management -- and luck -- you and your horse can have plenty of adventures together.